Caritas says States sent a positive yet weak signal of commitment to tackle climate change at the COP22 conference. It urges more action and clarification on key issues over the next two years to ensure the Paris Agreement really delivers for the poor. Areas that need clarification include Nationally Determined Contributions, the instruments for countries to establish their mitigation and adaptation programmes to close the greenhouse gas emission gap between current trends and the 1.5°C long-term goal. Caritas considers the inability to properly address agriculture and food security in climate negotiations to be unacceptable. After years of talks, no common approach exists to ensure vulnerable and hungry people are protected from the effects of global warming. 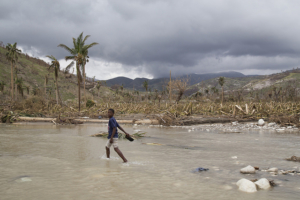 Scaled-up climate finance for developing nations is essential to ensure the implementation of the Paris Agreement and help vulnerable countries cope with climate change. COP22 and the submission of the US$100 billion roadmap by developed countries made steps in the right direction but more clarity is still needed on finance monitoring and reporting. The real priority for climate negotiations from now on is to address the gap in adaptation finance and ensure that climate finance is directed to those who need it most. Greater priority should be given to community-led climate adaptation programmes that target the most vulnerable. Caritas regrets that COP22 continued to side-line human rights, especially the rights of indigenous people, women, children and vulnerable communities. Climate change is causing increased displacement of people and threats to the existence of some countries and cultures, as denounced by vulnerable country groups such as the Alliance of Small Island States. Specific protection for climate displaced people was called for by civil society. Caritas urges future UN climate conferences to allow wider participation by civil society organisations to protect the principles of participation and access to information they intend to defend.